Granite Stone Diamond Ultimate Nonstick 5 Piece Kitchen Cookware Set – NEW! as_seen_on_tv has no other items for sale. 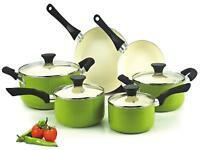 Details about Granite Rock 15 Piece Nonstick Ultra Durable Complete Cookware and Utensil Set! Granite Rock 15 Piece Nonstick Ultra Durable Complete Cookware and Utensil Set! 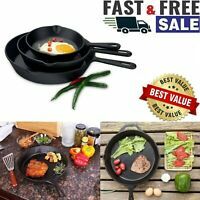 Fancy Cook 3 Piece Cast Iron Enamel Matt Black Skillet Set., Clearance Sale! There are 1,152 items available. Please enter a number less than or equal to 1,152. Sales tax may apply when shipping to: CA*(10.0%), IA*, MN*, NJ*(7.0%), NY*(8.875%), OH*(8.0%), WA*. Item received did not match ad description. ZERO communication from Seller. Never shipped and never heard back from seller; ebay had to step in for refund!! Long time coming but gr8 item. Love this cookware and highly recommend. Slowest order processing I've ever experienced. Pan did what it says it can do right out of the box, we washed it with warm water first (no soap) just to make sure there was no dust or dirt, and the eggs never stuck. They slid around the pan just like in the commercial and after the eggs were cooked nothing stuck. Pans are very light but durable, just stick to low to medium high heat and these pans will last. Don't use any sprays or a lot of oil, butter or very little oil is ok and avoid using any soap. Dawn soap is recommended to use from time to time, but try not to use harsh chemicals, hard soaps or hard scrubbers on the pans, it will take off the non stick coating over time. If you use them correctly you will never need to use these hard treatments to clean them cause food will never stick to the pans. I have bought mini nonstick pans over the years that claimed to be perfect the best etc. They all claim know oil needed to cook it will never stick. And they have all been less than stellar in the results. That is until I got this set. I fried an egg in the frying pan the first day I got it without OL end it actually slid around the pan and did not stick it all. I have since cooked many things in the frying pan. Nothing I have cook so far has had any issues with sticking to the pan. When I did use oil are used very little or in the case of grilled cheese I only used butter on the bread. So I bought the whole set. So far they are all exemplary and the best that I have used so far. Buy one of the skillet and try them out for yourself I do not think you’ll be disappointed. Best set of pots and pans I've owned to date! I was sold when I saw these were dishwasher safe. I have been dying for a set of pots and pans that didn't have to be hand washed, and these deliver. I am so very happy with this set of cookware! I love that these are non-stick, and the fact that one doesn't need oil to cook with makes me feel even better about protecting my families well being. My husband has high cholesterol, so being able to cut down with my cooking to help his diet is a big win. You can use these in the oven, so if you need to heat something up and then bake it you don't have to dirty another pan in order to keep your recipe moving along. These are not super heavy like cast iron, although they have a solid look to them. The handles stay cool during cooking. These will bring things to a boiling point much faster than regular pans, and has an overall even heat distribution. You don't have to turn the skillet different directions to heat things evenly. You can even use metal in these pans to stir food. That is amazing. You aren't going to hurt or scratch this set. This is meant to be used over and over. It's meant to hold up to your cooking needs. I have to admit, these pots were far better than I'd expected. I thought because of the size of the set and the price that they'd be more of a light-duty, use-it-for-a-year and then toss it away set. This is definitely not the case. Now, I've only been using them for about two weeks, but based on my experiences so far, this set is going to be long-lasting. The best thing about these pans is that they are well-made. The "granite" coating is thick. The bases are thick so they distribute heat evenly. The handles are heavy-duty stainless steel and not flimsy in the least. The lids are nicely constructed and have a nice solid feeling to them. (On a side note, because these are standard-sized pans, the lids are interchangeable with some other brands.) For the price, these are very nice and the fact that they have a unique niche to fill in the kitchen makes them that much better. So aside from their "feeling" which is incredible, I will say that using these pans is every bit as easy as the advertisements describe. You really can cook without any oils or lubricants and you really can use metal utensils without scarring the coating. We have made omelets and fried chicken and sauteed chicken, fried cauliflower rice, chicken korma, etc. and have had great results every single time. I've never had to scrub these pans after using them and they practically rinse off with water. I have hand-washed them and used the dishwasher and both ways they clean up very easily. I really like the double-boiler as it makes a nice steamer for vegetables and rice. It's large capacity makes it really stand out in this set. I was surprised it came with such a variety of pans, but I'm happy because it lets me choose from several. Overall I'm seriously impressed with the Granite Rock cookware set and I would highly recommend it for anyone looking for a non-stick pan. 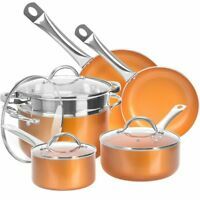 It's a great alternative set that allows for burn or scorch-proof low-fat cooking. Being a male, I cannot boil water without burning it. I approve of this product. It is well made. Comfortable in both large and small hands and pretty much does what it says. Well worth the money. Just wish it had a couple more pots of various sizes, so I can cook more and leave them laying around.